Channel your inner Princess and feel like royalty, this beautiful Vintage Czech Jewelry will certainly help you look the part! This dazzling piece will create striking elegance that turns up the luxe. From the late 1800s to the first quarter of the 20th century, Czechoslovakia was a major producer of high quality glass & rhinestones transformed into stunning, high end jewelry. A thrilling discovery of art deco salesman's samples in an old jewelry maker's vault, this is part of a cache of unused, near mint jewelry pieces for your collection. Each is a phenomenal example of the labor intensive construction and premium glass work involved in it's creation. 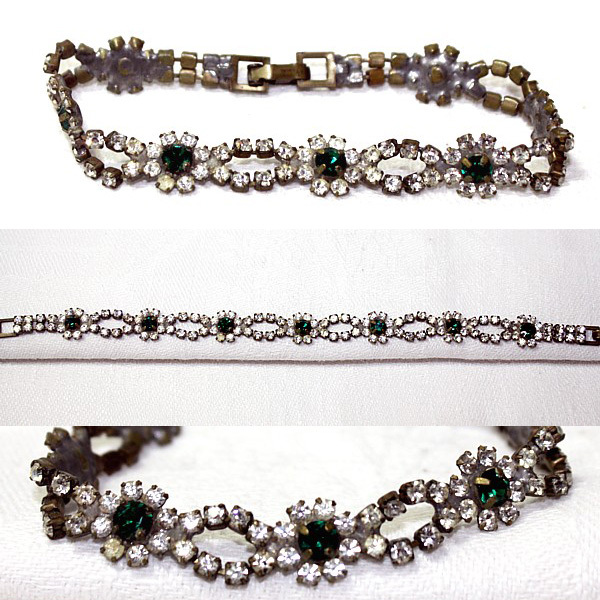 Bracelet with Emerald Green Stones, completely surrounded by clear prong set stones, elegant and dainty. Perfect for holidays, and every days. Measures 1/4" x 7~1/4" long.